In the very near future, our world will be drastically different. Almost everything in your life and in your city will be automated thanks to The Internet of Things (IoT) and 5G technology. Steve Case, founder of AOL, calls this the Third Wave which is about "integrating the Internet into every aspect of our lives in seamless and often invisible ways." This shift will have a profound impact for entrepreneurs as demand for products and services change as well as the type of workforce that is needed to support an uber connected world. So where do you fit in this new paradigm? What are the core technologies you need to integrate into your business? Where do you start? Begin by reviewing a framework. The Four Levels of a Connected City offers a simplified illustration of a complex system of how to integrate information and communication technology (ICT) and IoT with city processes and operations. The term 'connected city' is slightly broader than the industry term 'smart city' and seeks to include smaller municipalities that may not have smart city pilots or strategies underway. This model is inspired by an academic paper "The development of smart cities in China" by Yongling Li, Yanliu Lin and Stan Geertman. Technology means nothing without the human element. While The Four Levels of a Connected City is a focus on the devices and systems that power the future, it is critical to understand that this is all about people. Harnessing how innovation affects our lives from healthcare to banking to education is where the conversation truly begins. So ask yourself: What benefit does your company deliver to people? Do you provide more convenience or more safety? Do you help people save money? Do you help to create a more sustainable world? If you can answer this question in one sentence, then you have landed on the essence of why your company, product or service matters to a single individual. So now that you have the right perspective, let's cover the basics. Most of the articles, conference presentations and startup activity are focused on the top and most visible layer. The Device Level includes the hardware that you can see and touch including cameras, sensors, beacons, lighting and mobile phones. There are incredible opportunities here for entrepreneurs who seize the chance to create physical connected objects. An example of entrepreneurs who did exactly that is Soofa, which provides solar-powered benches and signs that offer wi-fi connectivity while also collecting data. You will see this kind of multi-function hardware in cities across the US in very short order. Soofa's approach is smart because they also highlight their integrated platform that provides visual insight into the data collected from the sensor-laden hardware. Which brings us to the next level, the Management Level. This part is more behind-the-scenes but no less critical to a connected reality. How information is collected, managed and secured is a vast area that is ripe for expansion. Phrases like Big Data, IoT, Cloud, have been called buzz words, but their impact on technology demands far more respect. Take a look at BlueCats, which is another example of a company that operates between the Device and the Management Level. While they do technically manufacture a device, it's what they do with it that makes it relevant to the Management Level. They provide a cloud service and integrated data solution that plugs into other backends like Amazon Web Services, Salesforce and others. They provide something for everyone, whether you outsource to their systems or integrate your own. They started in 2011 and today have four offices in Asia, North America and Europe. It's a great example of the limitless opportunities in the Management Level. Explaining the Internet seems a bit like trying to define air. You obviously know what it is and realize that it would be impossible to exist without it, but you may not realize the fundamental shift that is taking place from hardline (wired) Internet to wireless broadband. Today we depend on 4G and thanks to skyrocketing mobile traffic, capacity is becoming more and more strained. Smart city leaders are placing briefcase-sized small cells on light poles, on the sides of buildings and anywhere they can find to boost network capacity. The next few years will see the advent of 5G, which will power IoT and provide dramatically faster speeds. Trials are already showing connection rates 30 - 50 times faster than 4G. Consider how your company be affected by 5G. What will this mean to how you do business or how you connect with your customers? Getting deep in the details of this emerging technology may seem like a mind-numbing exercise but not understanding the applications of this next wave is akin to having a website that isn't mobile enabled. It's simply how business will work. Now this is the part that gets a little weedy, but it's important to again, have the fundamentals. These technologies - small cells, fiber networks, cell towers, power grids - are the base of the pyramid and serve as the foundation on which everything else runs. They make the Internet possible. Using the metaphor of a highway, the infrastructure layer is the asphalt. Your company can deliver the greatest product or service in the world, but if you can't connect to your customer base, everything ends. 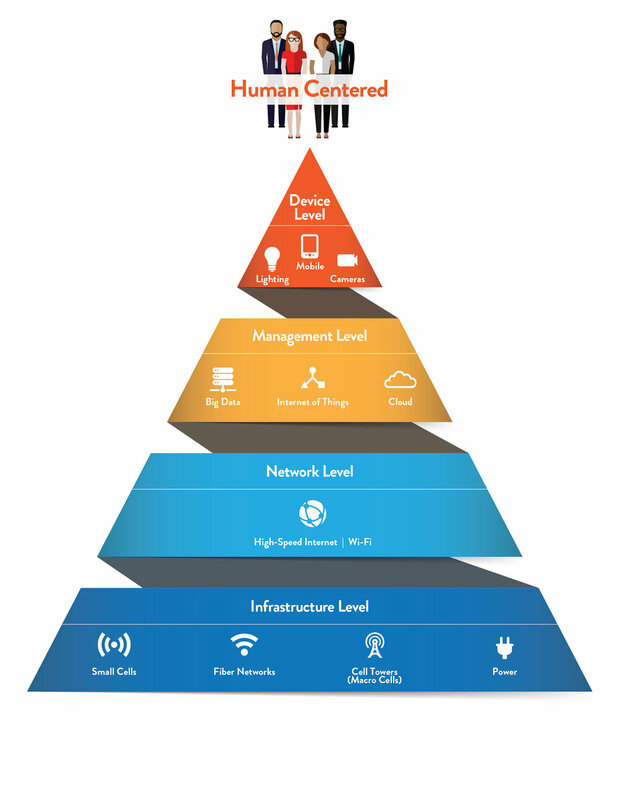 The Infrastructure Level includes the elements that make that physical connection possible. So now that you have a schema to sort out the dizzying amount of information out there about smart cities, IoT, big data, sensors, and everything related to the new digital reality, what will you do? Perhaps you can to read deeper to learn more? Or reach out to industry experts, suppliers, new partners to create new alliances? Maybe you'll add a new functionality to your product or service or maybe you'll see a gap in what currently exists and come up with a new technology? The most exciting part of this confusing and overwhelming time is the creativity that entrepreneurs bring to enable new solutions that can address challenges large and small for consumers and society.